*Now Pet Friendly! This cabin has a lot to offer with location and amenities. Blue Ridge is only about 10 minutes away with all of it's shopping and restaurants and yet the Ocoee river with it's whitewater rafting, tubing, hiking, fishing and mountain biking is also 10 minutes away. 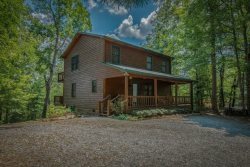 Wolf's Den is a beautifully decorated rental cabin with 3 bedrooms and 3 full baths. The cabin boasts an open floor plan with full wrap around deck and private "view balcony" off of 2nd floor master bedroom. This craftsman styled cabin is a departure from the average grade cabin with small rooms and no wow factor! Notable cabin features are, custom wrought iron and hickory staircase rail, sauna, s/s appliances, hardwood flooring, great room with custom vaulted ceiling and 3 tiered fixed glass wall of windows. The cabin's named is derived from the wolf carving on the front door and has been professionally decorated with classic rustic cabin decor. We loved our stay at Wolfs Den! The cabin was so comfortable. The views from the back of the house were amazing. Our spring break weather ended up being chilly so the hot tub and sauna were well-used. It was just the right level of secluded with grocery stores and downtown Blue Ridge all within a 10 to 15 minute drive. We are crossfitters and had a gym nearby too (CrossFit Fannin). If you are unfamiliar with the Blue Ridge area, beware that many restaurants end service after lunch and reopen for dinner. Our favorites were ice cream at C Bolts and Toccoa Riverside Restaurant which is an 11 mile drive. The drive is scenic so definitely worth it. Although the cabin is a bit more space than needed for our family of four, wed still love to stay there again.